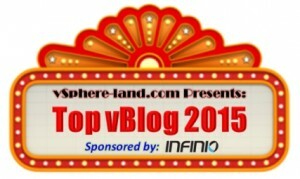 Like every year, Eric Siebert just started the voting for the best virtualization related blogs. Last year over 1400 people voted from all over the world. To vote you have to pick 10 favourite blogs and rank them in your order of preference. If you have enjoyed reading my articles or found solutions for your problems I would be pleased if you vote for virten.net. Last opportunity to recertify your VCP - Only 3 month left!